The Internet of Things was never envisioned as a way for Google, Amazon and Apple to hoover up all your data. When MIT's Kevin Ashton first proposed the IoT in 2009, his was a more utopian vision of RFID-tagged objects having their statuses checked and integrated. Of algorithmically optimised gadgets, watched over and quietly micromanaged by machines of loving grace. Today, low-power embedded systems have become sophisticated and cheap enough that it is becoming practical to not simply tag objects for centralised control but to give them some level of processing power. We aren't talking about AIs incarnated in your airing cupboard or sentient toasters, just devices that have a small amount of inbuilt nous and the ability to communicate either with apps, internet servers or each other. Gradually, more and more of the data flying around the internet will be both generated and consumed by machines. Naturally, this has aroused some suspicion about data privacy and the intrusion of big business into our everyday lives. This problem of corporate or government control is nothing to do with the concept of the IoT, however and everything to do with the way that technology companies have sought to control markets and exert a proprietary grip on services in the guise of integration. Alexandra Deschamps-Sonsino runs the London Internet of Things meetup and is the co-founder of Good Night Lamp, a company that makes internet-connected lighting. She thinks you should have full control over what happens to your data. "There's a space for a "public" drive to have access to what kind of data is being generated or gathered by a smart product and this should become accessible, monetisable and deletable by consumers by default," she explains. "Right now, people are reacting to the Google/Nest deal but that's one of many, many products out there and with a relatively small pool of devices. "I think if we give consumers tools to manage their data there will be lots of value there as opposed to fear-mongering. The industry is too young for fear right now." "Honestly, who needs a smart toilet brush?" The problem with understanding the IoT, is that it's too easy to just start naming household objects and saying that they could be connected to the internet. This is unlikely to happen beyond simple tagging (honestly, who needs a smart toilet brush?) - but adding a dash of smarts to things we use every day could bring about significant changes in the way we live. "If we embed products with a little intelligence we're able to see patterns in our behaviours as well as start to track things that we care about," says Deschamps-Sonsino. Health is an area that is already embracing the IoT. 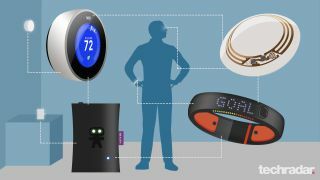 The idea of the quantified self, measured by tracker gadgets like the FitBit or Nike Fuelband, is becoming commonplace and as the tech gets smaller and more embeddable it will be possible to weave sensors into the fabric of clothing or footwear and into the realms of true health monitoring. Google recently patented a smart contact lens - not as a future iteration of Google Glass but as a way of measuring glucose levels in tears. Anyone at risk of diabetic shock would be able to keep tabs on their sugar levels without having to stop and take a blood test, while an app on a smartphone or other personal computing device could make great use of that data to trigger medication alerts or prompt for medical review. It's not just medical or biomechanical sensors and their data that will drive the IoT, however. If the quantified self is about optimising our health through new types of feedback, the quantified everything will give us a trove of data about our lives that could be used in many interesting ways.